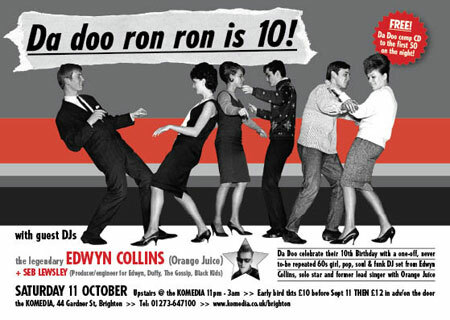 60s girl group extravaganza Da Doo Ron Ron celebrates its 10th birthday with a guest DJ appearance from Edwyn Collins, alongside friend and producer Seb Lewsley (producer / engineer Edwyn, Duffy, The Gossip, Black Kids) and residents Chris King and Simon Bridger. The venue is the Komedia in Brighton and the date is 11th October, where you can expect to hear 60s girl pop, soul and funk embracing 60s girl groups, Motown, Soul / Northern soul, Ye-Ye, Pop, Girls in the garage, Sister funk et al. Early bird tickets are £10 & available now until September 11th then £12 in advance / on the door. Check out the Komedia website or buy in person from the Komedia box-office / cafe.